Licensed physical therapist assistants are educated health care providers that work under the supervision of a licensed professional physical therapist and assist in the provision of physical therapy interventions. The physical therapist assistant helps manage conditions such as sprains/strains, fractures, back and neck injuries, sports and work related injuries, and others. Components of therapies performed involve exercise, massage, electrical stimulation, hot and cold packs, traction, and ultrasound. Physical therapist assistants are in constant demand both locally and nationally. The Medical Center Campus Physical Therapist Assistant Program is a two-year course of study requiring 74 credits for an Associate in Science degree. 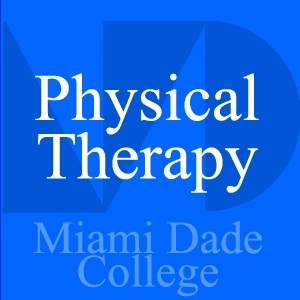 Before entry into the Physical Therapist Assistant program, students must also complete a series of general education courses at Miami Dade College. Completion of these courses does not guarantee admission to the program. The Physical Therapist Assistant Program provides learning experiences that enable the student to acquire and assimilate the necessary technical competencies to function effectively as a supportive health care provider in the physical therapy profession. In keeping with its mission and goals, and in compliance with Section 504 of the Rehabilitation Act of 1973 and the Americans with Disabilities Act, the Medical Center Campus promotes an environment of respect and support for persons with disabilities and will make reasonable accommodations. Please see the ADA Standards listed for this program. The Physical Therapist Assistant Program is highly demanding, and students are therefore more successful if they do not work while in the program. If students must work for financial support, the program strongly recommends a limit of 20 hours of employment per week. Students should also consider family responsibilities before committing to a full-time accelerated program. To facilitate the clinical portion of the program, students are assigned to a clinical facility within Miami Dade County . Students are responsible for their own transportation to the campus and to various agencies in the community to which they are assigned for clinical experiences. If your a new PTA the shank intervention will help your patient to see results giving them hope for rehabilitation. Use it consistently and help them to focus mentally to enhance the sensation. © 2019 OwlTail All rights reserved. OwlTail only owns the podcast episode rankings. Copyright of underlying podcast content is owned by the publisher, not OwlTail. Audio is streamed directly from MDC servers. Downloads goes directly to publisher.